The second installment of our summer series about enjoying in-season organic produce. Learn simple tips for highlighting summer’s bounty in fresh, well-spiced meals this summer! The peppery, refreshing crunch of summer radishes belie this root vegetable’s relationship to spicy horseradish and mustard. All are members of the Cruciferae family, named for the cross-like shape of their four-petaled flowers. Radishes are some of the first spring-sown vegetables available in fresh markets, and the earlier you get them, the milder and more tender they are. How to prepare it: Gently scrub radishes clean and trim away roots and tough leaves. An hour soak in fresh, iced water can improve the crunch and tame the overly peppery taste of particularly hot radishes. Radishes are best eaten fresh as crudités, sliced to adorn salads or onto sandwiches. A classic way to serve them is sliced onto soft, generously buttered bread, topped with flaky sea salt and freshly-cracked pepper. Spices and herbs to complement: Fresh springtime herbs are natural complements to radishes. Try gourmet salts, butter, cream cheese or goat cheese compounded with parsley, shallots, tarragon, dill, fennel fronds and chives. Pairs well with: The cooling tang of sour cream, yogurt and buttermilk dips and dressings pair well with radish. Finely diced radishes are an exciting topping for deviled eggs. Pickle red onions with sliced radishes for a year-round sandwich and burger condiment. Use them as soon as possible. Crisp them for an hour in iced water before eating them. Bread + butter + radishes = heaven. Slice onto green salads to add a healthy and lively crunch. Drink fennel or peppermint tea to ease radish burps. How do you like to enjoy radishes? Share your favorite tips in the comments! 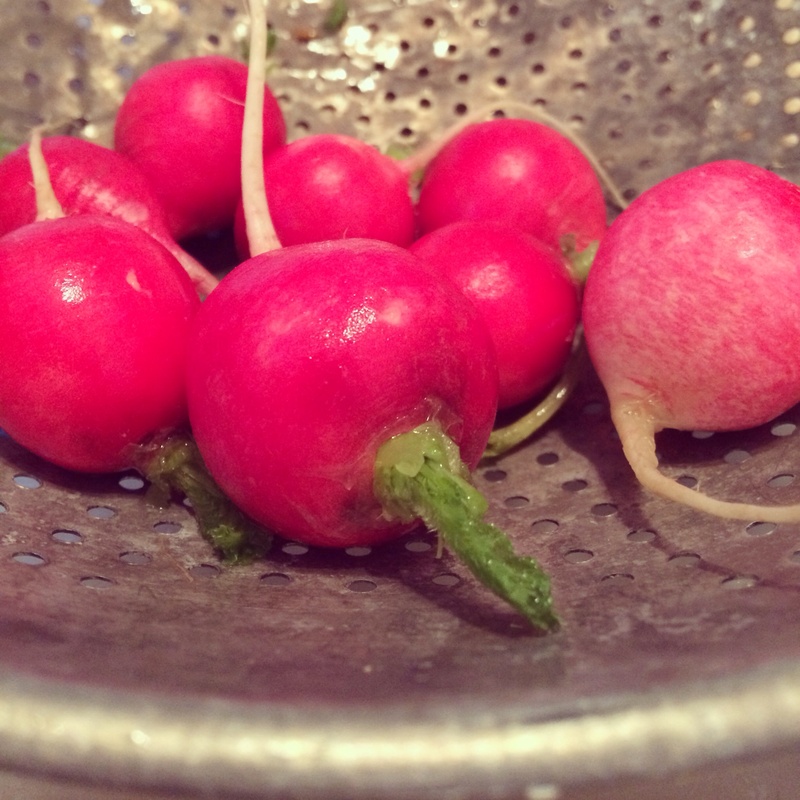 I’ve been loving the radishes I get down at my local farmer’s market…so peppery!